The final goodbye: what about the ashes? I don’t know what to do with the two tins of cat ashes sitting on my top shelf. 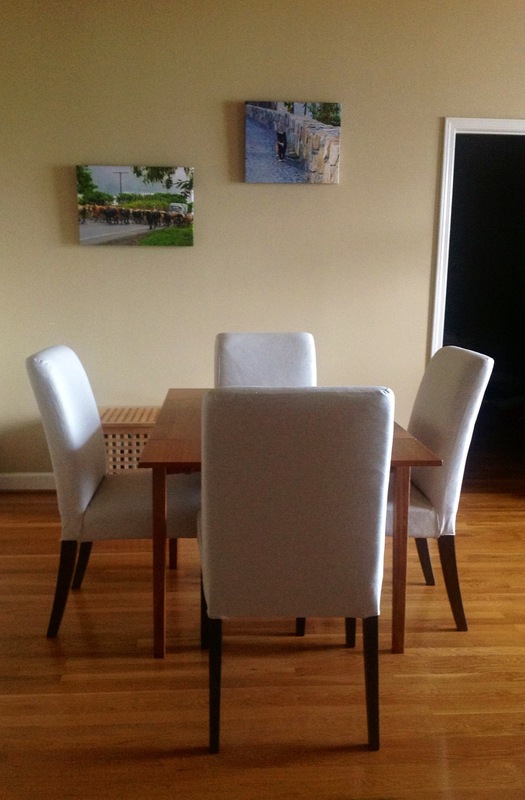 I never intended to keep them forever — I’m not exactly an ashes-on-the-mantel kind of girl. I couldn’t WAIT to get my dad’s ashes out of the house, heading to New Orleans to scatter them in the Mississippi River as soon as I could after they arrived in the mail. And it’s not like I want to scatter them someplace where I can return in reverence year after year — if I want to remember my cats, I can remember my cats anywhere. 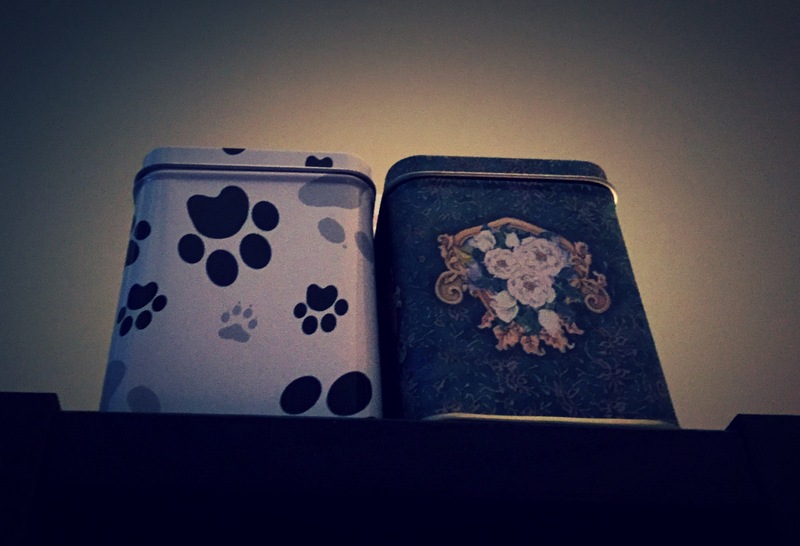 I have two tins of cat ashes only because I thought that I should scatter Yin and Yang at the same time. They were together pretty much 24-7 for more than 14 years, after all. We lived in a quite nondescript subdivision when they showed up, then moved to another subdivision, then moved to yet another subdivision before heading to Atlanta, where I don’t even have a potted plant, much less a yard or a garden. Besides, one of the reasons for moving to Atlanta was so we could be mobile, so it’s not like this place is necessarily going to be “home” forever. In other words, I have manufactured a relatively rootless existence for myself, with no appropriately resting place for beloved pets. Dilemma. They’re cool hanging out on the top shelf for now, I’m sure. There’s no higher spot in the condo, save for the top of the kitchen cabinets, which, I have to admit, they would have found a way to climb onto during their glory days. Maybe this is one of those solutions that hits you out of the blue, like realizing that you can wear the same dress at the Monday-night conference reception AND on Wednesday so you won’t have to pack so many outfits. I just want it to hit me: The cats would LOVE it here. Let’s go get the ashes. 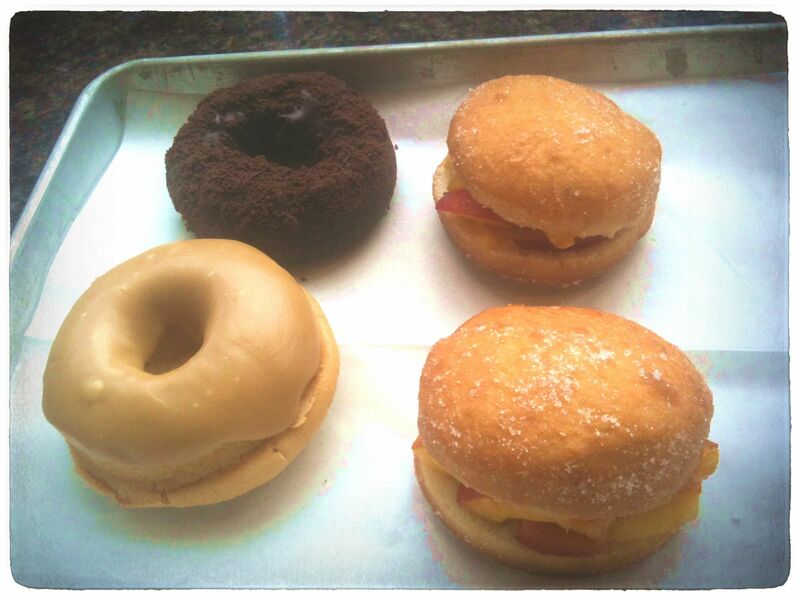 Clockwise from top left: triple chocolate cake (probably), peach sliders, salted caramel cake. So I did. Meh. They seemed like doughnuts that were trying too hard. I know it seems weird to say that a doughnut is too sweet, but those doughnuts were way too sweet. Luckily, my doughnut salvation appeared in the Atlanta Food & Wine Festival’s tasting tent. The Revolution Doughnuts table was freshly out of peach sliders, but the reps were on board for doughnut chat, complete with a knowledgeable sidebar on our favorite New York breakfast haunt, the Doughnut Plant. A couple of weeks later, we made the 15-minute journey to Decatur. The peach sliders? Everything a fruit-themed doughnut should be, and more. The fruit was fresh and deliciously sweet, while the doughnut itself was rather neutral, allowing the peach flavor to shine. My other selection was the salted caramel, which offered a nice balance of a slightly salty icing over a delicately textured, sweet (but not too sweet) cake doughnut. The husband chose (I think) a triple chocolate cake doughnut, which was delightfully chocolatey without going overboard. You might think we spend every Saturday morning in Decatur now, but doughnuts are a sometime food. Plus, the line at Revolution Doughnuts isn’t exactly inviting; a 20-minute wait in Georgia’s summer sun does not exactly whet the appetite. We’ve decided that all future visits will be to-go orders; the chaos of such a small dining area (you have to cross the children’s play area to reach the coffee station, a seemingly dangerous path while holding a cup of hot java) isn’t conducive to a relaxing breakfast. Plus — sorry Atlanta — people-watching in New York City is way more interesting. 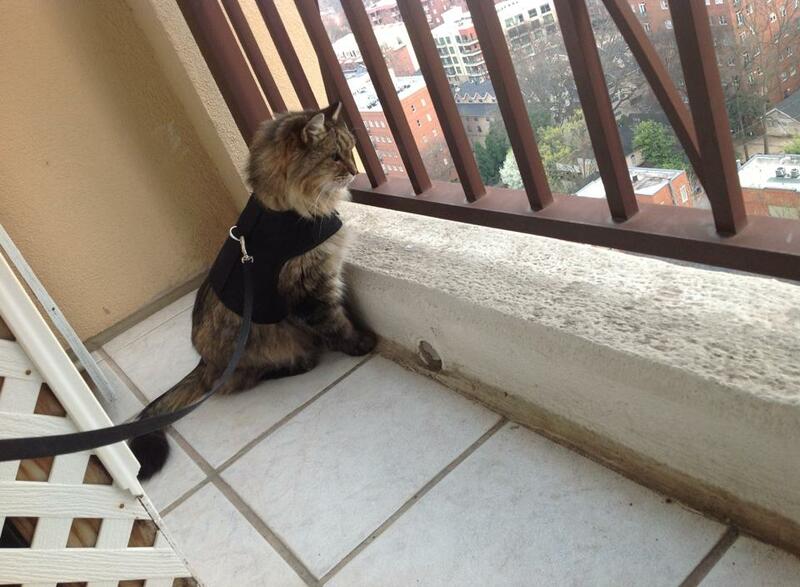 The last time I mentioned Yang on this blog, I talked about the unexpected success of getting him to wear a harness so he could be a balcony cat on the 16th floor of our condo. He had a fantastic spring out there with us, full of cool breezes and irresistible puddles of sunshine, a combination that enabled some of the most peaceful and satisfying naps of his life. 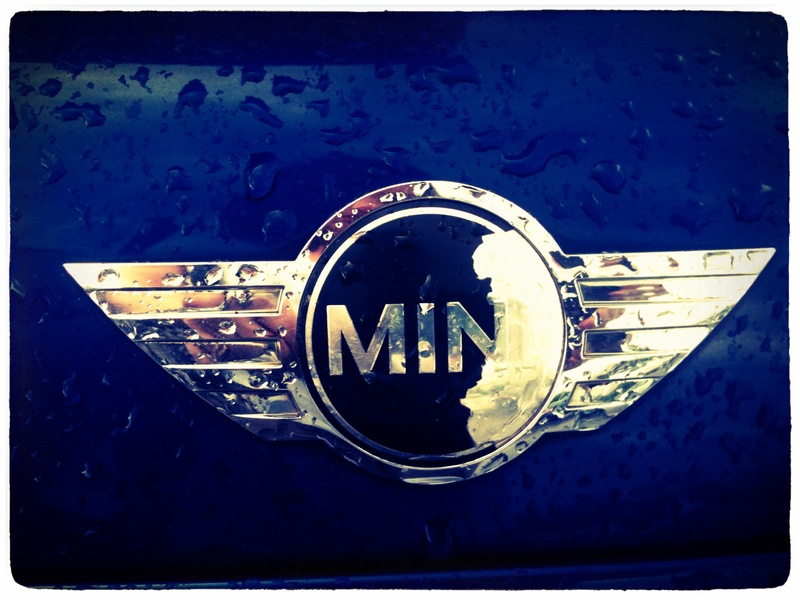 It’s taken me a long time to work up to writing this post. Yang died on May 19 after a short bout with cancer. He was happy enough, but we knew he was slowing down. He had become so docile that, as you can see in the photo above, we would often let him wonder around on the patio without his harness. Like all good animal emergencies, Yang’s problems started the very day I left town for a business trip to San Antonio. A mere two hours after I had landed, the husband called to tell me that he had found blood in the litter box and had already made an appointment with the vet. I stumbled through the better part of 24 hours, not knowing if I would still have a cat when I flew home. Cancer. Probably. In his intestines. The only way to know for sure was to do a biopsy, which was a patently ridiculous notion given his age — he was nearly 18 (for all we know he was ALREADY 18, since we had made an educated guess when Yang and his brother showed up and simply let them share my June birthday). To be clear, the vet didn’t push this option, but instead offered a couple of palliative treatments that cleared up the blood problem and seemed to perk him up a little. So, I came home to help run a cat hospice. He was a great patient. He decided that his usual diet wasn’t going to cut it anymore, and would only eat Trader Joe’s Tuna for Cats, with minuscule doses of Pepcid AC. I figured it wasn’t the worse thing in the world, giving a dying cat whatever he wanted. He had a pretty good two weeks. 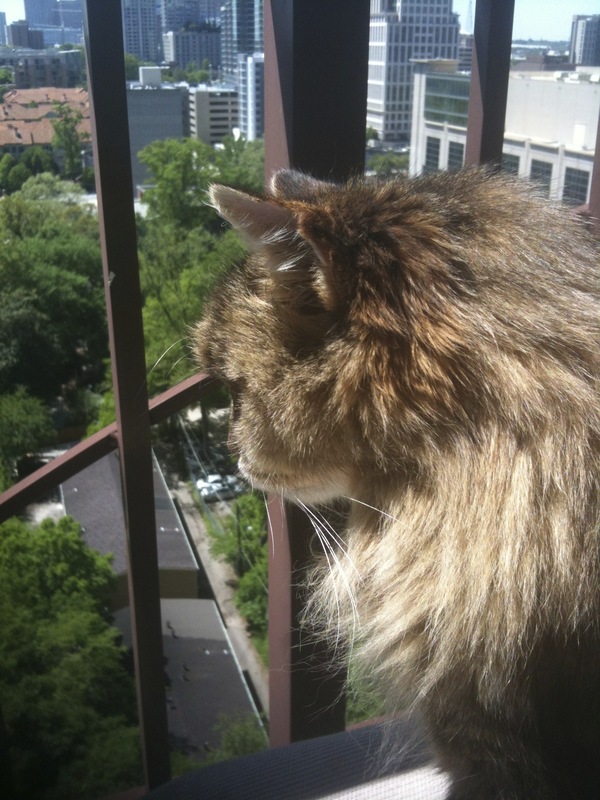 He ate, he drank water from the bathtub faucet, he chased sun around the condo, he moseyed out onto the balcony when he got the chance. That final Sunday, though. Wow. He got 100 percent worse in a matter of hours. You know that horrible feeling, when you’re taking care of an old animal, or one that’s simply too sick to go on, that you won’t know when it’s time to let go? We totally knew it was time to let go. We called in a euthanasia specialist (apparently a thing in large cities, thank goodness) so we wouldn’t have to subject him to a car ride. Dr. Katie Billmaier with Lap of Love Veterinary Hospice was a blessing that day. She came through the front door and immediately began doting on Yang. Part vet, part social worker, she let us tell her stories about him and completely control the timeline. It was all very gentle and very peaceful. Like his brother before him, Yang was dutifully driven to the crematorium by the two people who had cared for him since he and his brother showed up on the carport of our rental house in Mobile, Ala., in 1996. We wrapped him in a pillowcase that my grandmother had embroidered (it matched the one that Yin was cremated with) and outfitted him with Greenies, a spoonful of catnip and a couple of toys. Thus ends the saga of Yin and Yang, two Very Good Cats. The condo is unbearably quiet at times, although it’s not so much the sounds of Yang that I’m missing (he was notoriously opposed to noise), but simply his presence. You spend 17 years with a furry little beastie, you expect him to be in one of his spots. We’re cat-free for the moment. 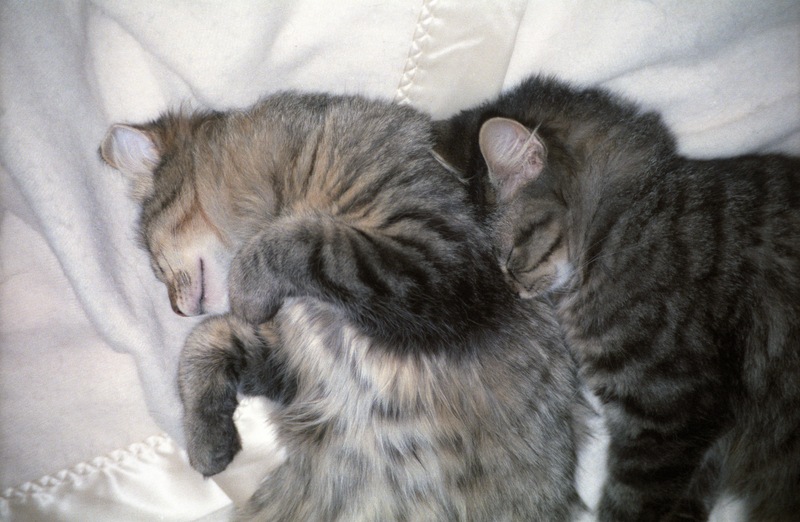 After caring for a quiet, older cat for so long, I don’t know that we have the patience or time to return to the hijinks of younger cats. Mostly, though, I get the feeling that these guys might just be irreplaceable. R.I.P., Yin and Yang. 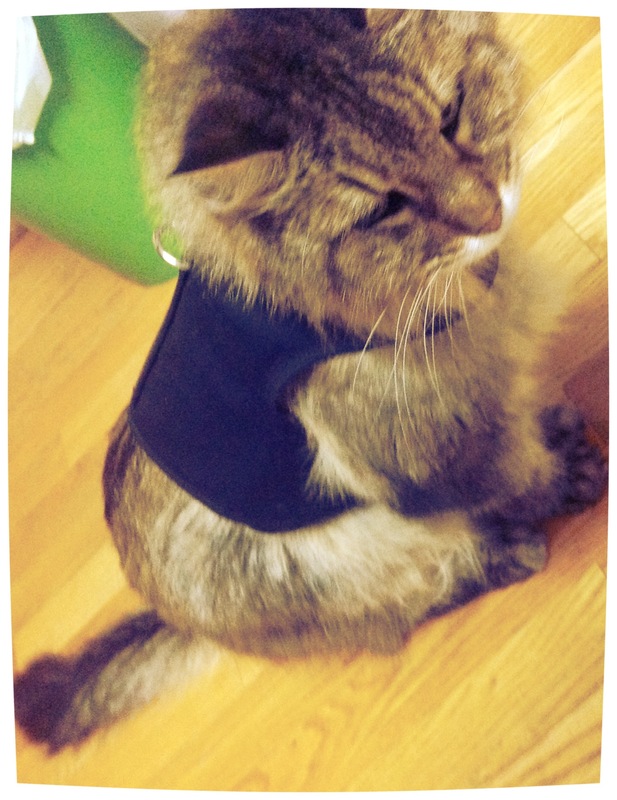 Lest we enjoy the cityscape without him, Yang now enjoys full balcony privileges thanks to his new Kitty Holster. 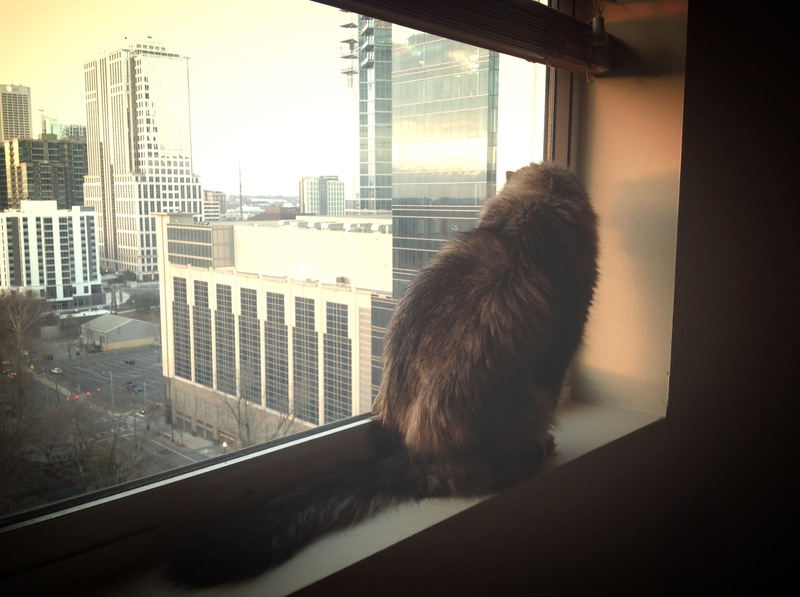 We’re 15 floors up in our new place, and I was pretty paranoid that he could fall off, seemingly crazy reasoning that was reinforced when our cat-sitter told us about another cat who fell from a balcony on a lower floor and broke his leg. Thus, the harnessing of Yang. I honestly didn’t think this was going to work. I mean, who puts a harness and a leash on a 17-year-old cat? But we had to try. Every time we sat outside on the balcony, we faced a sad cat peering through the blinds, not understanding that we were outside and not just in another room. There are chairs out there, after all, and sometimes we were eating and drinking, all signs of normality, not kitty danger. I expected either hysterics or complete collapse when we strapped Yang into the getup. Nope. He let me secure the Velcro and snap on the leash, and then he walked straight to the balcony door, all, yeah, this is what I wear when I go out on the balcony. LIKE A BOSS. He gets tired of balcony time after a few minutes, but he’s happy to be part of the action. I don’t think he’ll be walking to the park, despite the many suggestions of friends and family, but he is certainly going to enjoy quite a few sunsets this spring, complete with cool breezes.